It started with a bag of paper mache eggs I got on clearance last year for 50 cents a bag. I thought I would use them to make birds . . . something I've had on my mind to do. But, as a crafter, you all know those feelings, the inspiration hasn't come yet to get started with that project. Since the easter season is upon us, I've joined so many in making yet another simple and easy banner. 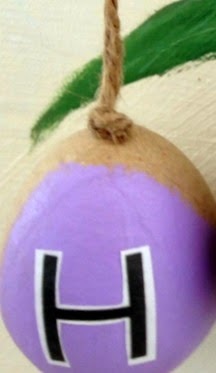 Starting with the paper mache eggs, I sponged painted just the front with an easter shade of light purple. And then got carried away with what I was doing and forgot to take pictures of what I did next. I printed off the words HAPPY EASTER, cut them out and mod podged the letters onto the eggs. Then I knotted strips of twine, added tacky glue and attached with straight pins through the tops of the eggs. At first I thought I would hang the eggs from a branch (horizontal) of a tree that had spring blossoms. But then I realized that I didn't have a branch long enough to line up all the eggs and one very important discovery . . .
Do you know how hard it is to get the letters to hang straight in front if tied to a branch? 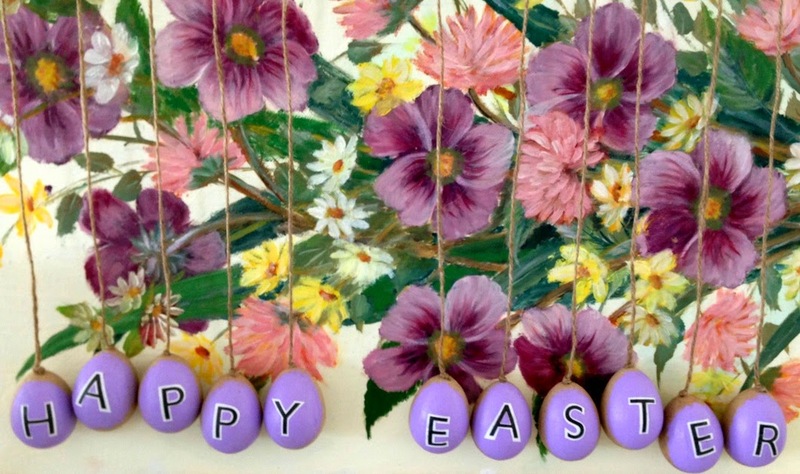 Luckily, I had a springy flower painting my mother-in-law had done so I turned it sideways and attached the twine attached eggs. I was able to line up the letters with the support of the canvas. Spring sure is bursting out all over . . . and Easter is almost here! So fun for Easter. I have not done a single Easter project because I've been so busy oing some other big things around the house. I probably should get on to it. Gail that is one beautiful painting your MIL did! Love the banner and I can imagine trying to get stuff to hang evenly from a branch! LOL! I like your idea better! Sorry to delete my comment. I misspelled Easter - oh my! Just wanted to let you know that I love your eggs. I hung my eggs on the branches of an Easter Egg Tree last year, that did not work out well (they would not stay straight). I will use your inspiration and redo them with the jute strings (I love jute) and hang them as a banner over the mantle. Thank you for sharing! What a great idea for a banner! Love that you used jute twine for hangers. That gorgeous painting is a perfect backdrop. Super cute egg banner. If you have not shared at the Bacon Time linky yet, please do. I love purple too. We dyed some eggs purple this morning. What a gorgeous idea! I love the colours that you used too-very Springy! I love the finished project! Great job! The darling eggs against the painting is a wonderful idea. I have forgotten to do any eggs for Easter. i know there are paper ones somewhere. This would be a cute gift for Easter. Beautiful!!! Congrats for your creativity! Thanks for sharing! Your purple Easter eggs are fabulous! This is totally a project I can do with our little girls and they will love the purple color. Thanks for sharing. Hi Gail, I love your Easter egg banner and am so glad you linked it up at the DIY Sunday Showcase Party. I've added it to our DIY Sunday Showcase Talent Board on Pinterest! You egg banner is so cute! I am a purple girl too, so I had to come over and visit! Gail, this HAPPY EASTER craft is EGGdorable! Thanks for sharing and linking up again with us at the #WWDParty! Have a wonderful weekend! so fun and how easy to personalize! love the idea, thanks for sharing!